Here is a simple question: Why is it that the All Blacks go into every World Cup as favourites? Is it because: A-The Haka; B-Their ominous black kit; or C-The fact that their winning percentage since 1986 (the year before the inaugural World Cup) sits at 82.3%? The introduction of the World Cup to the international rugby calendar was a hasty decision back in the mid-80s and the first two instalments were almost seen as a nuisance to the old order. But since 1995, when Nelson Mandela and Francois Pienaar catapulted rugby to a much wider global audience, the tournament became the focal point of the rugby calendar. As a result, for the Springboks and several other countries, everything appears to be geared to towards winning the Webb Ellis Cup to the detriment of just about all else. New Zealand of course, are desperate to win the World Cup too, but they have never done it at massive cost to the All Black legacy. Losing Tests has always been unacceptable to New Zealanders whereas in SA and other countries, losses have been excused as ‘building towards the World Cup’. It’s quite simple really. How can you expect to win a World Cup if you go into the tournament on the back of regular defeats and poor form? It can happen of course, as it can happen that a form team (NZ) doesn’t win the World Cup, but it’s not a great strategy. Which brings me to Rassie Erasmus’ Boks. Erasmus has pleaded from the outset that he needs to find a way to develop a team to meet the challenge of RWC 2019 in Japan, and he has been given the slack required. The Boks were in a low spot after 2016 and 2017 and while they haven’t exactly summited Mt Rugby yet, the signs have been encouraging. Erasmus has had 10 Tests to tinker with his team – he has used 46 players this season – and he must now have a good idea of what his best 23 looks like. November Tests against England, France, Scotland and Wales are next, which are four of seven matches that remain before their September 21, 2019 meeting against the All Blacks in Yokohama. Erasmus’ side, after a year of tweaking and fiddling, has only won five of the 10 Tests played. 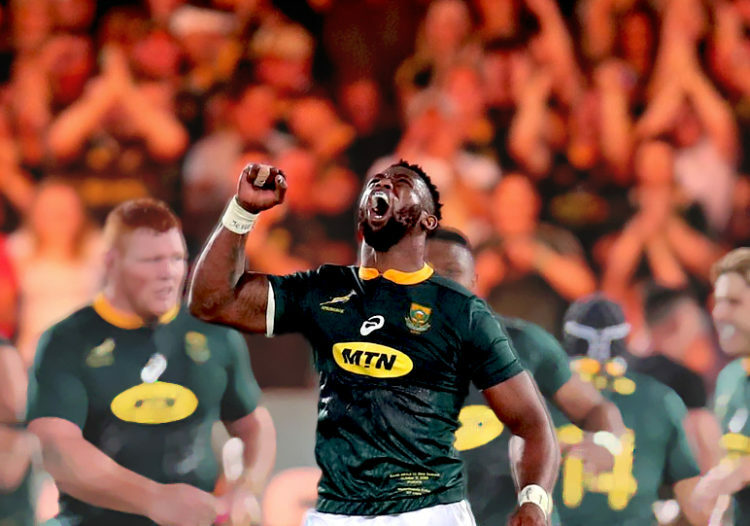 November in the United Kingdom and France looms as a critical period for the Boks to start building momentum to the World Cup, but more importantly establishing themselves as a force in the game again. The Bok coach can’t afford to tinker on the coming tour, although in some cases he will be forced to make changes due to the unavailability of players such as Faf de Klerk and Willie le Roux. But the time for wholesale experimentation has gone. It’s time to win at all costs. Nothing else matters because nothing builds confidence internally, and fear externally, as much as a winning team. I hope the language used by the Boks in the coming month is only about winning and performance and not about building to the World Cup. The foundation has been laid throughout the Rugby Championships and the June Internationals. The Boks have a strong base to work from and they have the spine of a good team. They have some confidence after two epic battles against the All Blacks and they are coming to grips with the defensive system Jacques Nienaber said would take months to bed down. The Boks shouldn’t even mention the World Cup again. This tour is only about the present. Win at Twickenham, win at Stade de France, win at Murrayfield and at the Principality Stadium and there will no need to talk about the World Cup. Everyone will know the Boks are coming. I fully agree with you. The Boks have now shown that they can tangle with the best, so now they need to show that they can be consistent. Take every game as serious as you would the All Blacks. We need to set a new standard. Spot on. If we do not win at least 3 out of 4 we will not win the WC. Lets hope we hear no more of this WC rhetoric. In saying this we also need to understand that Rassie has politics to deal with and will not always be in a position to put his best side on the park. Just as long as they are good enough to win I will be happy! It has been my view for some time now! Win & the World Cup takes care of it’s self! A winning culture creates momentum and confidence, whilst losses create question marks and lack of confidence! My main concern on the EOYT is that of selection. We have access to loads of players, but at the moment we seem to be focusing on a few “favourites” that frankly have let the side down. I think Erasmus needs to be a little brutal with selections and give some fresh faces a chance – I am talking here, primarily of the bench and fringe players. Our core starting 15 have generally been solid, but it is the replacements and second tier that are concerning! A lesson surely learnt from the recent AB loss is that you cannot go head to head with the top teams in the world with inexperienced boys. Players considered should have at least two full years of Super Rugby experience! I am not sure what the current status on Pat Lambie is but, for me, he is a no brainer. As you rightly say experience is what is required in the year going forward. Lambie covers fullback and flyhalf and is probably better than both incumbents. He also serves a a 2nd goal kicker. IMHO he is one of the most talented footballers this country has produced. Willemse and Galant have plenty of time after the WC to make their mark. Oh so RIGHT! The absence of Lambie is provocative…. Yes John, I agree it would be great to have Lambie in the mix. His game management and tactical kicking are unmatched. If the initial assessment of 6 months was correct, he should be on his way back soon, agw. Yes, Willemse at 20 has loads of time – they are really trying to force things at the moment and that’s not good for the man or the team! I suspect Galant will make the EOYT. He is 23 so has a little more maturity and experience – as you point out Rassie needs to keep the numbers up. Exactly! Now some interesting selection issues coming up for Rassie, we know Faf wont play and not counting on Willie to get much game time either. The obvious choices would be Papier & Willemse, we know Willemse can become something very special and Galant hopefully to back him up! however Papier has not had enough game time to really make an impact and with Ross Cronje out, Rassie will have to pick someone relatively experienced in Reinach or Schreuder? I think Marcell Coetzee will make a return and JL De Preez as well, we’ll probably see Nyakane back and perhaps Coenie? Our wings looks set with Mapimpi, Nkosi and Dyanti! Sorry Vossie, but I just don’t get the ongoing fixation with Willemse? He certainly has potential, but he is way too young and inexperienced! There have been a few moments of brilliance, but these have been completely overshadowed by some absolutely outrageous moments! He needs to get more experience at SR level. Thus far, he has had three outings at test level totally about 50 mins and has conceded two tries in the process. At full back, I would put anyone of Kriel, Galant, Bosch or Mvovo well ahead of him! I have to agree with your view on willemse….he’s got plenty time to develop. Why deny other mature talents opportunity by playing willemse….. he’s got a great step but in two Bok games was responsible for two tries against by poor pass and out of position…. experience should be developed at SR playing against AB and Wallabies! I’d be inclined to direct you to the number of SR seasons they played before Boks and their talents may just be that much better…. To address the Scrum Half issue, I would take Ruan Pienaar on the EOYT along with a number of other more junior candidates. He has 88 test caps – you just cant buy that sort of experience – and he would be a great mentor and help develop our second and third choice 9’s. If Faf de klerk was injured come RWC time, we’d be in a spot of trouble, but with Pienaar in the system, we’d have some insurance. The few Montpellier games I have watched this season, he has looked good as gold! To be honest, I’m not sure what the deal with Papier is. It’s not like he’s the starting scrummie at the Bulls. I’ve not really seen him play or turn the game on his head. If you want to go local, I’d give Louis Schreuder a look at. For overseas I’d go for Reinach. Let Pienaar live out his retirement in France. He’s too slow for test rugby now. Agree Chris, I think we need to assemble a bunch of 9’s and see who comes out tops. Rassie need to make targets so I am sure that Papier will be on the list, though I agree that he has not done anything really to deserve it. No disrespect, he is just very new on the scene and needs time! Slow as molasses, I cringe when I watch him clearing a ball. I think that some mistake his step as a flaw, but that keeps the opposition loose forwards honest. Faf de Klerk, whilst in SA had very slick base service, but this was so predictable, that the Loosie’s just drifted to the 10 channel because they knew where the ball was going. He has matured considerably during his stint in the UK and he is also hovering a bit to keep the opposition guessing! Fair point, perhaps the biggest problem was a coach picking players unsuited to the kind of game he wanted to play when some lesser light may have actually suited his gameplan (lack of) better. I dont mind the step if it does keep the opposition guessing, but with modern defensive patterns, it just seems to give them more time to rush. I still think one of the best ways to exploit the rush defence is with a sniping scrum-half around the fringes backed by a suitable loose trio. It also serves the purpose against teams like the AB’s to keep them honest so you don’t have hookers and 8th men parking in the tramlines. From what I have seen Papier once he has matured a bit, will be ideal for that kind of gameplan. I agree with you on Pienaar, he’s been playing well for Montpellier! Would need his presence to calm things down and he knows the European conditions very well, saying that you would have to start with Papier or Van Zyl and if things go south bring on Pienaar! Pienaar has made himself unavailable for the Boks already. I can’t see him coming out of retirement to play 4 games when he’s not in Rassie’s World Cup plans. Reinach on the other hand is hungry to play for the Boks again. Rassie should negotiate to have him play all 4 tests and allow Papier more game time from the bench. You are right Dean, but I suspect his decision was heavily influenced by a wish not to get involved with the Coetzee clan. He also took loads of stick during the Meyer era because of the amount of kicking that went down, but it is probably a little clearer now that he was being instructed to do that. It is not his natural game! Just feel we are in need of some maturity and experience in the 9 slot, particularly as we are tending to play predominantly off 9 at present, so a young boy is not going to cut it! A good lead article and I agree every test should be played to win as if it were a WC playoff match. To do that you must put your strongest available 23 on the park in every match irrespective of ‘color’ restrictions. The last time out we have been beaten by four of the seven teams coming up before the WC. Add to that a narrow victory over the woeful Aussies last time out, a much improved Scotland since we last beat them in 2015 and the unpredictable French team and most certainly no ‘easy matches’ lie ahead. For those who excuse Rassie or sympathize with his dilemma don’t, He gets paid handsomely for his troubles and took the job fully aware of it’s challenges. In my opinion he has in fact gone too far with his accelerated transformation program where we ended up with many ‘Boks’ of similar average standard with only a very few real standouts. Notwithstanding the Bok implosion last Saturday he is now expected to win all the upcoming matches and lack of experience, attitude and ‘getting the basics right’ can no longer be an excuse for inconsistency. What may well scupper him apart from the ‘quota’ challenge is still a lack of primary skills, mental strength and the good old nous factor which I believe is still in short supply. Selections addressing these shortcomings with a game plan to match will be crucial over the next 9 months. The honeymoon is over for Mr Erasmus and there is no longer a place to hide. Win at all costs should be the battle cry and picking the best of the best on merit should be the only criteria. A very interesting EOYT awaits us and good luck to Rassie and his team. Cheers. perfectly said Vossie. we trying to build a new team within the laws of South Africa. we don’t want players with experience but no extraordinary talent. eg Ruan Pienaar. Lambie has had many chances. unfortunately his career never truly went to the levels we hoped for him. enough with him now. the guys that are being mentioned are old school. Lambie got 5 minute cameos and still won the Boks an AB test! He would have been a shoo in if CJ Stander had not ended his game with his highly dangerous late tackle/barge (1 game suspension?). Look at how many games EJ has had and I don’t recall him setting any game on fire…. no, Lambie would be a huge asset!